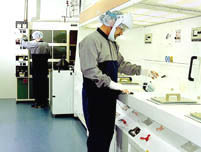 SiTek has gained a worldwide reputation as a constantly developing manufacturer of advanced PSDs. The discovery of the lateral photo effect by Prof. J.T Wallmark and the development of the Position Sensing Detectors (PSD) during the sixties led to the foundation of SiTek Laboratories AB in 1976, with the aim of exploring commercial applications for the technology. Foundation took place at the Chalmers University of Technology in Gothenburg, Sweden and in the beginning production was carried out by the founders working part time at the university's Institute of Solid State Electronics. Today, more than 25 years later and in a constantly expanding market, SiTek has gained a worldwide reputation as a constantly developing manufacturer of advanced PSDs. Outstanding linearity, high resolution, high speed and excellent product quality are the main features of the SiTek products, valued indeed by top-range optronics customers. Important year in the history of SiTek was 1984. 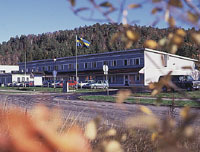 The founding company was bought by an investment group and moved to modern facilities in Partille - a suburb to Gothenburg - where a new cleanroom, together with all other necessary equipment for production and development of PSDs was based. The second half of the eighties was, however, a difficult time, since the market was not yet ready for utilization of the products. It was found that the venture needed considerably more marketing, customer training, support and collaboration than had been thought. Rapidly, two changes of ownership took place, while technical development and close cooperation with loyal customers went on untiringly. The beginning of the nineties brought a stabilization of activities, at the same time the market began to discover the abilities of the PSDs. A fast expansion, 30% in 1995 and 1996, occurred after the new profile and the revised name SiTek Electro Optics was introduced 1993. However, the most important task at that period was the launch of a number of new PSDs, with highly improved performance in hardly all criteria's. Of those listed below, the most adequate is the NT-PSDs, introduced 1995, with patented stray light elimination. Now the century has turned to a new, demand for constantly improved components are growing fast and SiTek PSDs turns out to be of good value for the optronics application producers. Looking back to another 30% raise of both production volume and profit in 1998, we are proud of being awarded Optronic Company of the Year 1999 by the Swedish Optronics Association SWEDOPTRONICS. We believe that our intense research and development, the improved capabilities of providing customised design PSDs means valuable benefits for our customers in their competitive markets. Whenever you work on measurement of position, distance or motion, don't hesitate to contact us.